The 900 for larger area - Take the exceptional characteristics of the 700, add a wider sweeping path and a greater working autonomy (thanks to a larger waste debris hopper) and you have - the model 900! It is intended for sweeping in areas where greater productivity is required. The optimum weight, distribution and the two castor wheels on the front of the machine ensure unequalled maneuverability for its size, a most important feature for a walk-behind unit. 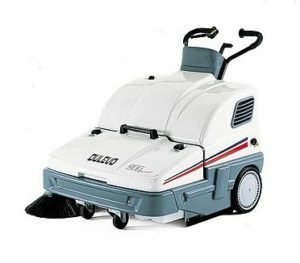 In line with the model 700, the 900 is equipped with side broom adjustment from the operator's working position. A vacuum shut-off is fitted for use in wet conditions. The Dulevo 900 Sprint, maximum performance with minimum effort!